Variety reports that Oscar-winning director Danny Boyle (Trainspotting, Slumdog Millionaire) is now high on MGM's wish list for directing the next James Bond movie. Boyle, known for his fast-moving, visually stunning films, is no stranger to James Bond. He's actually already directed Daniel Craig as the character in an appearance with the Queen in the opening ceremony to the 2012 London Olympic Games. (I had so hoped the segment would be included on the Skyfall Blu-ray, but alas, it wasn't. This essential part of any complete James Bond film collection is, however, available on the UK BBC DVD London 2012 Olympic Games, but not the American equivalent.) Additionally, the movie that shot Boyle to international fame, Trainspotting (1996) featured characters who loved to talk about James Bond, especially their Edinburgh hometown hero Sean Connery. Much of the Bond discussion came from the character Sick Boy, who was played by Jonny Lee Miller (Elementary), the grandson of original M actor Bernard Lee. The bestselling Trainspotting soundtrack even featured a song by Blur frontman Damon Albarn, "Closet Romantic," whose lyrics consisted solely of Albarn reciting the titles of Sean Connery James Bond movies. So Boyle has quite an arms' length history with Agent 007. He's also been rumored as up for the plum Bond directing gig several times in the past. According to the trade, "Boyle has keen interest in the project and has always wanted to direct a Bond film. He is currently developing a project for Working Title, but with no cast currently attached, there is always the possibility of pushing that movie back to direct the 25th installment in the series." No formal offer has yet been made, however, and 71 and White Boy Rick director Yann Demange (said to be a favorite of producer Barbara Broccoli) is still in the running as well. Denis Villeneuve (Sicario, Blade Runner 2049) previously turned down the Bond 25 assignment in favor of his Dune passion project, and both Skyfall and SPECTRE director Sam Mendes and tabloid favorite Christopher Nolan (The Dark Knight) have ruled themselves out from helming Daniel Craig's final Bond outing. As previously reported, the still untitled Bond 25 is set to open November 8, 2019. No distribution partner has yet been named after Sony's co-production deal expired following SPECTRE, but MGM recently struck a wide-ranging distribution deal with Annapurna which could ultimately include Bond 25, but doesn't as of yet. Two years ago we heard about Official Secrets, a fact-based spy movie with an incredible cast about GCHQ whistle blower Katherine Gun. The all-star cast was to include Harrison Ford, Anthony Hopkins, Paul Bettany, and Martin Freeman, behind Game of Thrones' Natalie Dormer in the lead role. But as exciting as that cast sounded, nothing ever came of the movie. Now it's back on track, but reconfigured with a different cast. The Hollywood Reporter reports that Keira Knightley (The Imitation Game) and Matt Smith (Doctor Who) will now star in the revamped version of Official Secrets. Justin Chadwick (Mandela: Long Walk to Freedom, Spooks) was originally set to direct, but now Gavin Hood (Tsotsi, X-Men Origins: Wolverine) will serve in that capacity. Official Secrets is still based on the 2008 book The Spy Who Tried to Stop a War: Katharine Gun and the Secret Plot to Sanction the Iraq Invasion by Marcia and Thomas Mitchell. The title pretty much says it all, but Gun (who more closely resembles Dormer than Knightley) leaked an email to The Observer exposing an illegal U.S./UK intelligence operation designed to influence U.N. approval of the 2003 invasion of Iraq. The film, financed by eOne (who will also distribute in certain territories), is set to start shooting next month. Yesterday, Ian Fleming Publications announced the title of the next official James Bond continuation novel--the second by Foyle's War and Alex Rider creator Anthony Horowitz. Out in May in the UK, but not until fall in the U.S., the new novel will be called Forever and a Day. If that title sounds somewhat familiar (or at least evocative), it's because last year saw the release of a quasi-James Bond novel by Hard Case Crime (not affiliated with IFP) called Forever and a Death. Forever and a Death was the late crime novelist Donald E. Westlake's novelization of his own rejected script for the Pierce Brosnan 007 movie that ultimately became Tomorrow Never Dies (and was novelized under that title by Raymond Benson, then the reigning Bond continuation author). While it was based on the plot that Westlake concocted for the film, James Bond himself was, obviously, not a character in the resulting novel. Nor is there a direct and obvious Bond analogue with only the name changed. There are instead a number of heroes working independently to stop the villain's plot, none of them secret agents. But here's the rub: Forever and a Death was simply a better Bond title than Forever and a Day, with that classic, darkly comic, ironic Ian Fleming twist on a familiar phrase along the lines of Live and Let Die or You Only Live Twice. 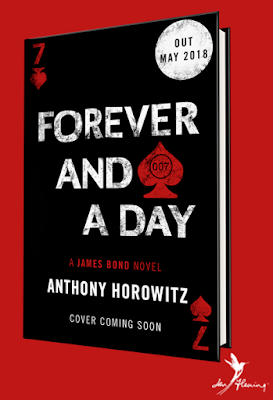 (John Cox at The Book Bond has pointed out that Diamonds Are Forever was simply an unaltered phrase, too, but I would argue that the irony comes specifically in the pairing of that title with that story... and indeed perhaps that will be the case with this Horowitz novel as well.) It's kind of a shame that a Bond novel should be out-Bonded by a quasi-Bond novel before it even existed. All that said, though, were it not for the existence of Forever and a Death, Forever and a Day would be a pretty great title--far better than Horowitz's first Bond title, Trigger Mortis, or indeed any of his Alex Rider titles. And of course it's really the story inside that matters, not the title. After all, Devil May Care was a great Bond title, but proved a lousy Bond novel. And Trigger Mortis sounded more like an Alex Rider title, but turned out to be one of the very best Bond continuation novels. I have faith that Horowitz can do it again! That time period is interesting, as no 007 continuation novels to date have taken place immediately prior to the events of Casino Royale. (Though Charlie Higson's and Steve Cole's Young Bond novels obviously take place a good deal prior to that book, when James Bond is just a schoolboy.) It's also been announced that an upcoming Dynamite comic book (also officially licensed by IFP) will focus on Bond's war years, so slowly but surely all of his life prior and up to becoming a Double O agent is being revealed. Forever and a Day by Anthony Horowitz will be published May 31, 2018 in the UK by Jonathan Cape, the original publisher of Ian Fleming's James Bond novels and now an imprint of Vintage Publishing. It's available for pre-order from Amazon.co.uk. There's no word yet on who the U.S. publisher will be come Fall, but Trigger Mortis was published here by Harper Collins, as was Horowitz's most recent novel, his clever twist on Agatha Christie-style murder mysteries Magpie Murders (whose U.S. publication was also substantially delayed from its UK debut), so I'd say they seem like a good bet. Well, here's some unexpected and very cool spy news! According to Deadline, teenage superspy Kim Possible is poised to make a comeback after an 11-year absence. (And a decade after an unsuccessful campaign for a fifth TV season.) But not quite as you might expect, should you be familiar with the hilarious, whipsmart cartoon spy parody Kim Possible that aired on the Disney Channel from 2002-2007. The new Kim Possible will be a live-action movie. The trade reports that series creators Mark McCorkle and Robert Schooley have penned the script along with Josh Cagan (The DUFF). Adam B. Stein and Zach Lipovsky (Mech X4) will direct. Casting is currently underway. Unfortunately, the new Kim Possible won't be a theatrical feature, but a Disney Channel Original Movie. In the original series, Kim was an ordinary teenage girl dealing with ordinary teenage problems like crushes, dating, acne, social hierarchy, cheerleading, and homework... along with less average ones like supervillains, monkeys, ninjas, and monkey ninjas. Because in addition to being a regular full-time high school student, she was also a freelance superspy and crime fighter. (Her genes were in her favor, being the daughter of a rocket scientist and a brain surgeon.) With her best friend and sidekick, the clumsy but utterly loyal Ron Stoppable, his pet naked mole rat Rufus, and 10-year old Q-type gadget genius Wade, she took on the likes of the nefarious Dr. Drakken and his henchwoman Shego, Lord Monkey Fist, Señor Senior, Sr. and Señor Senior, Jr--not to mention her cheerleading rival, Mean Girl Bonnie Rockwaller. Part Buffy the Vampire Slayer and part James Bond, the series never condescended to its young audience and featured razor-sharp scripts sure to entertain any adult spy fan with humorous send-ups of 007, Mission: Impossible, S.H.I.E.L.D., Alias, and countless more spy standards. It was also quite impressive visually, with sets galore inspired by Ken Adam. I'm a bit dubious about the live-action angle, and particularly worried about how Rufus, the naked mole rat, will be handled. (An anthropomorphized CG critter could ruin a live-action version.) I wish we were getting an animated feature or a rebooted cartoon series, but I'm excited to see Kim Possible returning in any form! The original remains one of my favorite spy shows of this century. As promised, Paramount released the full trailer for Mission: Impossible - Fallout today, the sixth film in the series starring Tom Cruise. A cut-down version of it also aired during the Super Bowl. Rather unsurprisingly after two truly stellar franchise entries, it looks pretty awesome. I'm not sure it's possible to top the airplane stunt in the last movie, but this helicopter stuff looks pretty cool. I am a bit worried that this entry will be even more Cruise-centric after Rogue Nation and especially Ghost Protocol had made such great strides toward the team dynamic of the TV show, but with such a solid (and large) supporting cast including returnees Simon Pegg, Ving Rhames, Rebecca Ferguson, Alec Baldwin, Sean Harris, and Michelle Monaghan, and newcomers Angela Bassett, Vanessa Kirby, and Henry Cavill, perhaps that won't be the case. Yes, I know... this is a lot of speculation from me over a quick image of a man in profile chained to a hospital bed. But these are the things I fixate on. According to Variety, The Hitman's Bodyguard and Expendables 3 director Patrick Hughes has attached himself to helm the action-comedy Unsafe House for Lionsgate. The trade reports that the script by Adam J. Epstein and Andrew Jacobson "follows three friends who rent a Bahamas beach house over the summer for some R&R, only to come [to] realize that the location is actually [an] MI-6 safe house already occupied by a CIA operative. 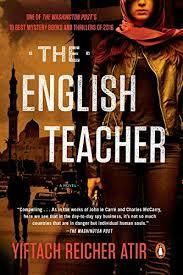 When the house comes under attack, the three friends must team up with the spy in order to survive the ordeal." I have to say, I like the sound of that! Is it possible that Hughes will reteam with his Hitman's Bodyguard star Ryan Reynolds, and that the star of Safe House (the less said about that 2012 spy movie the better... though I did say a lot more in my review, here) will also star in Unsafe House? The trade does not indicate that, but it's kind of fun to imagine. Today Paramount released the first advance poster for Christopher McQuarrie's Mission: Impossible - Fallout. 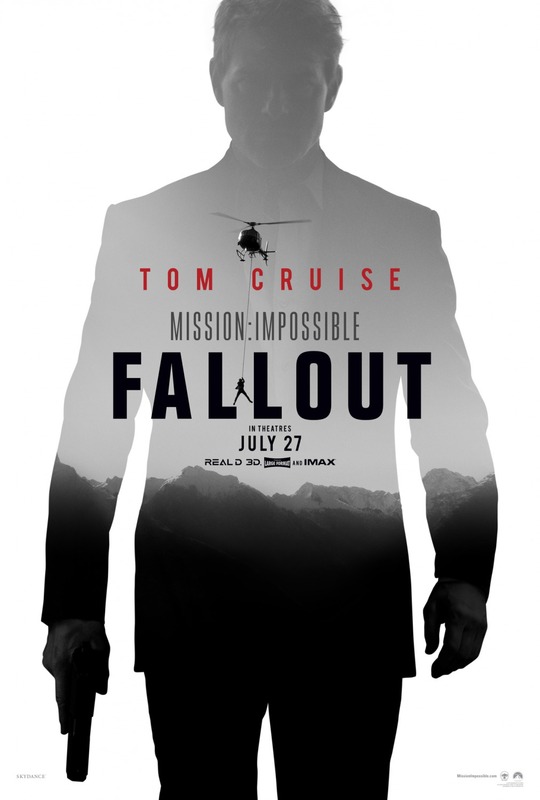 I could be wrong, but off the top of my head I think this may be the first time a Mission: Impossible poster has depicted Tom Cruise holding a gun. The trailer is expected to drop this weekend, along with a Super Bowl spot. The sixth entry in the venerable film franchise (and second to be directed by McQuarrie, who also helmed Rogue Nation) opens July 27, 2018.